My most recent cookbook purchase, for my already ridiculously large collection, was one called Confetti Cakes, written by one of New York City’s hottest custom cake decorators. The book contains cakes that are perfect replications of everything from a Chinese take-out box to a pair of Manolo Blahnik shoes and the box that they came in–all edible! A master cake decorator is something that I aspire to be. I love the creativity and challenge involved and the sense of pride that I feel when the cake’s recipient is “oohing” and “aahing” over my latest masterpiece. While I am not at the “designer shoe” level yet, I am always practicing to improve my decorating skills. Don’t worry if the batter appears to be runny. It is supposed to be this way and it results in a very moist cupcake! This is also the batter that I use to make chocolate cake–it works well for both. When decorating cupcakes, I find that it works best to only fill the cups halfway full with batter. This produces a nice even surface for you to work on. The curved surfaces are tougher to decorate. When tinting the cupcakes, gel paste works better than liquid as it doesn’t dilute the consistency of the icing. 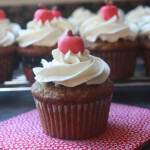 If you are using liquid, be sure to make the buttercream a bit stiffer in consistency when you first make it. Use the best cocoa powder that you can find. Chocolate and cocoa are two ingredients where the quality really comes through in the taste of the recipe. I buy my cocoa in bulk from The Baker’s Catalogue because I use so much of it, but there are good brands on supermarket shelves as well (Scharffen Berger, Guittard, Callebaut, Schokinag are a few). Don’t let the fact that you don’t own cake decorating tools intimidate you. I wouldn’t make the investment until you decide that cake decorating is something that you want to do more of. For your reference, I have pictured the couplers, decorating bags, spatula, and tips below, but for most of them, you can substitute everyday kitchen items. For piping, just take a small ziploc back, fill it with the desired color of icing, and cut off a small diagonal piece from the corner. This will give you the equivalent of a #3 tip for the wreath. For piping the Santa, use the same method–you will just have circles instead of stars. As an alternative, you can spread the beard and the hat with a knife or offset spatula instead of piping. Preheat the oven to 350F degrees. Line two 12-cup muffin tins with cupcake liners. In the bowl of an electric mixer fitted with the paddle attachment, mix the flour with the sugar, cocoa powder, baking soda, baking powder, and salt at low speed until combined. In a medium bowl, whisk th buttermilk with the oil, eggs, and vanilla. Slowly beat the buttermilk mixture into the dry ingredients until just incorporated, and then slowly beat in the hot coffee until fully incorporated. Pour the batter into the cupcake tins, filling each about halfway full. Bake for 20-25 minutes, or until a cake tester inserted into the center of a cupcake comes out clean. Let the cupcakes cool in the tin for 10 minutes and then transfer them to a rack to cool completely. In the bowl of an electric mixer fitted with the paddle attachment, combine the confectioner’s sugar and butter. Mix on low speed until well blended. Increase the speed to medium and beat for another 2 minutes. Add vanilla and cream and continue to beat on medium speed for 1 minute more, adding more cream if necessary for spreading consistency. Tint one cup of vanilla buttercream with green icing color. Ice cupcakes with a smooth thin layer of white icing using the offset spatula. Prepare a disposable decorating bag with the #3 tip and coupler and the green icing. Pipe a wreath around the edge of the cupcake using a zigzag motion. Repeat the piping step to add height and dimension to the wreath. Sprinkle the wreath with the nonpareils. For the bow, roll out a gumdrop on a surface sprinkled with granulated sugar to make a 3/4 inch by 3 inch long strip. Cut the strip in half to make two 1 1/2 inch long pieces. Fold each piece in half to make a loop and pinch at the end to taper. Position each half on the cupcake. Cut another gumdrop in half and place it between the two loops to finish the bow. Dab the bottom with a little bit of buttercream if necessary to stick. Tint 1/2 cup buttercream with a light pink or light tan color. Spread each cupcake with a thin layer of this color. Tint 1 cup of buttercream with red icing color. Prepare one disposable decorating bag with 1 cup white buttercream, a coupler, and the #16 tip. Prepare another decorating bag with the red buttercream, a coupler, and the #21 tip. Position a small red candy for his nose and pipe two blue circles for his eyes. Use a 1M tip for the larger swirls. Pipe a swirl on the surface of the cupcake and then pipe a second swirl on top of the first one for height. 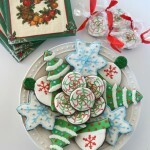 Sprinkle with red or green sanding sugar and top with red or green starlight mints. Top with red hots and green sprinkles to represent holly. Top with red and green M&M’s.